Food, Civil Supplies and Consumer Affairs Minister Punjab Mr Bharat Bhushan Ashu today said that the department would ensure timely procurement of each and every grain of wheat from all Mandis of the state. He assured that no farmer would suffer due to late procurement and lifting of the wheat crop. 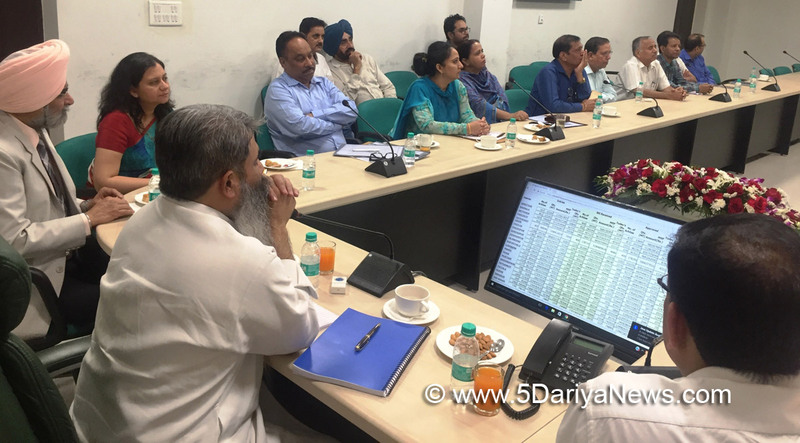 Mr Ashu said this while holding a review meeting with the officers of Food, Civil Supplies and Consumer Affairs department at Anaaj Bhawan in Sector 39, here today.While addressing the officers, Mr Bharat Bhushan Ashu said that it is Chief Minister Capt Amarinder Singh’s commitment with the farmers to ensure timely procurement and lifting of wheat crop. He urged the officers to ensure that no farmer suffers due to any delay in procurement and lifting.The minister directed the officers that they should perform their duty with utmost devotion and honesty so that smooth procurement and lifting of wheat crop can take place in Punjab. He said that Punjab being an agrarian state, the farmers are the backbone of our economy and the department should ensure that they should not suffer in the mandis.Earlier, the Food, Civil Supplies and Consumer Affairs Minister was welcomed at Anaaj Bhawan by Principal Secretary Mr KAP Sinha and Director Mrs Anandita Mitra. He also interacted and addressed all the staff of the department at Anaaj Bhawan and urged them to perform their duties with honesty. Mr Ashu said that he believes in transparent governance and hopes that the officials would not let him down.Prominent among those present on the occasion included Chairman, PUNGRAIN Mr YS Ratra, MD, PUNSUP Mr Amarpal Singh, President, State Consumer Disputes Redressal Commission Justice (Retd) Paramjeet Singh Dhaliwal, besides several others.